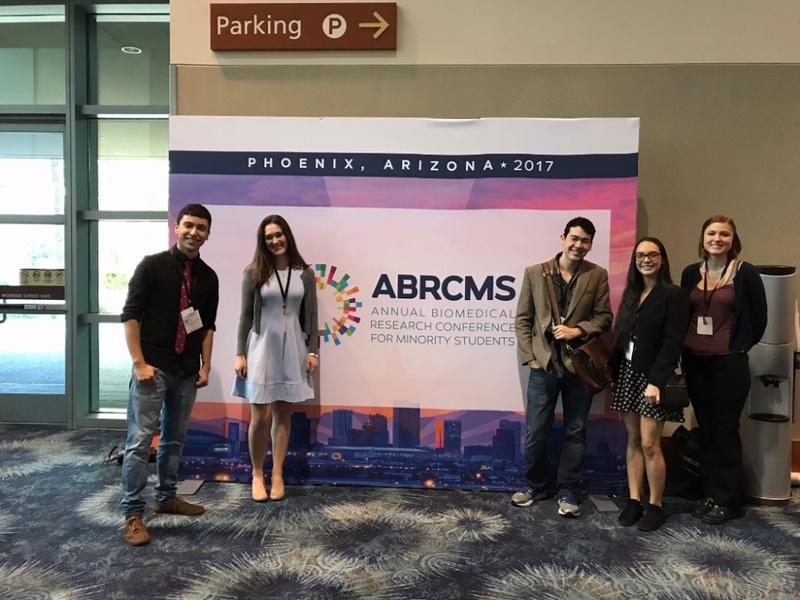 Third-year Clark Honors College students Nelson Perez and Lilly Carroll were two of the hundreds of students across the nation to attend the Annual Biomedical Research Conference for Minority Students in Phoenix, Arizona, last November. At the conference, Perez and Carroll presented posters of their research conducted in University of Oregon labs in summer 2017, and they had the opportunity to connect with other students in their field and network with representatives of potential graduate programs. Perez received an award for a poster on his neuroscience research. 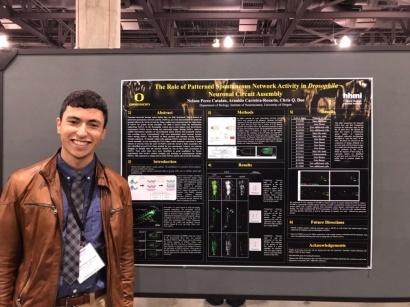 Both Perez and Carroll were encouraged to apply for national conferences during the Summer Program for Undergraduate Research, a 10-week program through the UO that encourages undergraduate students in life sciences laboratories to participate in ongoing research. Perez worked in professor Chris Doe's lab, which investigates central nervous system development, and Carroll participated in professor Judith Eisen's lab researching the intestinal pathologies of zebrafish enteric nervous system mutants. The research opportunities and accolades Perez and Carroll have received stem from their own motivation to join labs early in their college experiences. Perez ended up being hired for the position at a lab that worked in what at the time was his dream field, cardiology. Perez spent two terms working as a lab aide and gaining an understanding of life in a laboratory. Once Perez gained the basic skills he needed to contribute to lab research, he sought out work in neuroscience, a topic that caught his interest as he progressed through his classes. The Doe Lab hired Perez to work directly with postdoctoral students on their research because of the skills he could offer from his time as a lab aide. Carroll found her start in lab work through a program called JUMP, for Joint Undergrad-Grad Mentorship Program, that she joined early in her freshman year. “It was a group of undergrads working with grad students, so we would get grad students’ perspectives on how to navigate a science education and how to get involved with the community,” Carroll said. During her sophomore year, the program passed out pamphlets of the UO labs that were hiring undergraduate lab aides. Perez said that the experience of lab work can, at times, be more beneficial than typical classes. Imposter syndrome can be a major self-deterrent from applying for the multitude of opportunities students have at the UO. “You’re in college because you are passionate about X, Y, Z and when you pursue those passions you have more of an idea of who you are and what things you can achieve,” Perez said. For students who are curious or concerned about joining a lab, Carroll said you shouldn't get discouraged by the job hunt. “It took a lot of rejections from people for me to get into a lab,” she said, speaking about the 10 other professors she emailed whose labs were unavailable or who just weren't interested. She also cited graduate employees as a great resource on available undergraduate positions. Perez advised students to watch out for the imposter syndrome, something that he struggled with early on. Both Perez and Carroll want to have their research published in a journal during their undergraduate experience, a difficult feat for professional researchers let alone undergraduate students.